First things first they’re the cutest. When they went camping inside. When Boo was sleepy and fluffy. it's monday. why am I being woken up? sooooooo … what's going on up there? When they were all disheveled after their walk in the rain. rainy walks … we may need some additional styling products after this. nothing beats a good belly rub. When they hid amongst a bunch of impostors. When they recreated Michelangelo’s Creation of Adam. When Boo nuzzled Buddy’s neck and Buddy just went with it. true love tip #147: true love is embracing weird quirks and loving them for it. can't get me enough buddy! When it was Boo’s birthday. When it was bath time. sleep train … toot toot! When they had a slumber party. pillow paws and pajama parties! When Boo just really wanted to hang out with his best Buddy. much to buddy's dismay, stalker laws do not apply to dogs. i will follow him forever and ever! When the celebrated for no reason. we're in our birthday suits! it's neither of our birthdays, but we figure someone out there is celebrating being another year wiser so give us some cake! When they peeked over this seat. all eyes on buddy. buddy fact #5: buddy is the best buddy/big brother in the world. he always keeps his cool when i pester him. When they were all smiles. 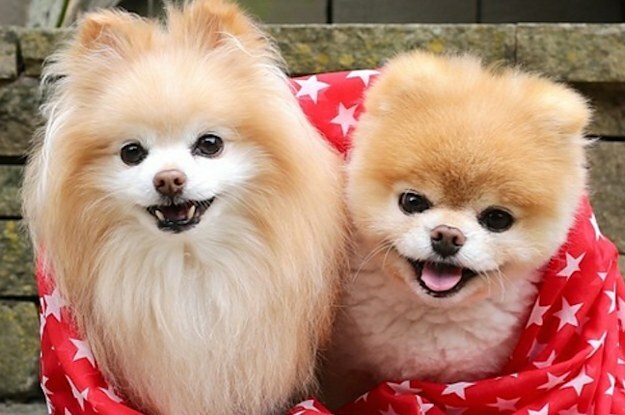 true love tip #61: true love is sticking together and celebrating that two different pups can make one dynamic duo! anyone seen a couple of easter bunnies around? anyone? When they were pampered pups in Vegas. first trip to vegas for the buds and me! we were too short to reach the blackjack tables, so we opted for the pampering route. thank you to @trumplasvegas for the amazing surprise welcome. we are so very relaxed and ready to get in with our regular routine of sleeping and eating cookies. When they visited the Grand Canyon. what a grand canyon! they should name it that. When Boo made this deal. i think the deal is that i get to sit on the couch, sleep in your bed, and be presented with a daily array of treats. you get to sit next to me on the couch, sleep next to me in your bed, and feed me those treats. everyone wins. let's shake on it. When they took a moment to smell some flowers. flowers smell sweeter with your forever friends. When Boo was a Boo-Rex. legend has it that the boo-rex was once the most feared creature in all the land. peek-a-boo! buddy fact #2: due to a scary incident several years back with a much larger pup, buddy is sometimes nervous around other dogs. he, however, always puts on a brave face for me, let's me hide behind him whenever i need to, and smiles to say everything will be a-ok. When it was Buddy’s birthday. happy independence day to all our friends! remember to be a buddy to your pups today, and keep them safe and secure. fireworks are beautiful to see but scary to hear! hold your pups close, and let them know that everything is a-ok! xoxo buddy & boo. When they happily posed for the camera. When they visited the Big Apple. city date night on our terrace. we are on at least our third glass of water, and the night is still young! When they visited wine country. spent the weekend in wine country with my best buds! we like bubblies. it makes us burp. when your human tells you playtime is over, try flashing this face. it never fails. true love tip #129: true love is putting up with your less mature other half and loving them anyway. When Boo was a personal space invader. one of us is a firm believer in personal space. the other is not. a little hopscotch with my best bud. it's a tie! When they were bandits for Halloween. the b&b bandits! stealing hearts is our business. happy halloween to all our friends!! When they climbed these stairs. true love tip #127: true love is facing life's challenges together. When Boo met Liam Payne. When they overindulged on Thanksgiving.